The wolfSSL embedded SSL/TLS library was written from the ground-up with portability, performance, and memory usage in mind. Here you will find a collection of existing benchmark information for wolfSSL and the wolfCrypt cryptography library as well as information on how to benchmark wolfSSL on your own platform. If you would like additional benchmark data or have any questions about your specific platform, please contact us at info@wolfssl.com. 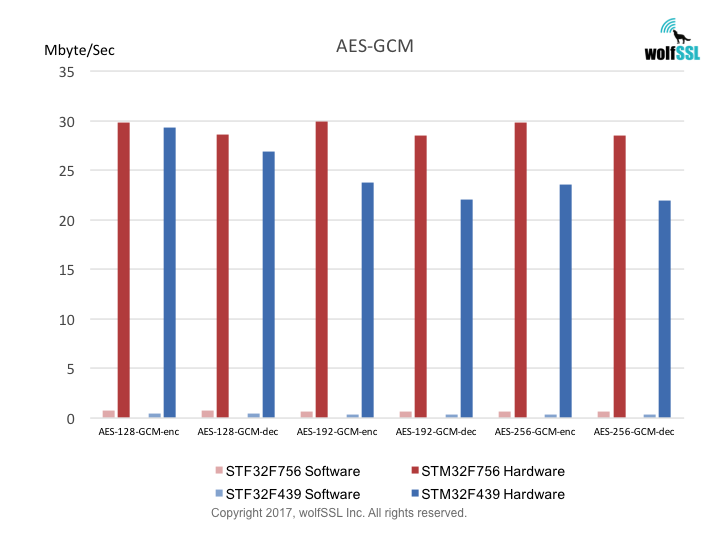 Many users are curious about how the wolfSSL embedded SSL/TLS library will perform on a specific hardware device or in a specific environment. 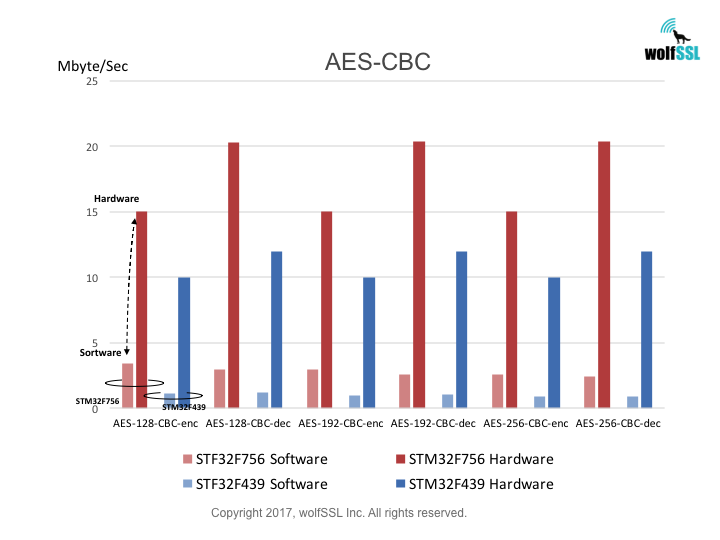 Because of the wide variety of different platforms and compilers used today in embedded, enterprise, and cloud-based environments, it is hard to give generic performance calculations. To help wolfSSL users and customers in determining performance for wolfSSL and wolfCrypt, a benchmark application is bundled with wolfSSL. 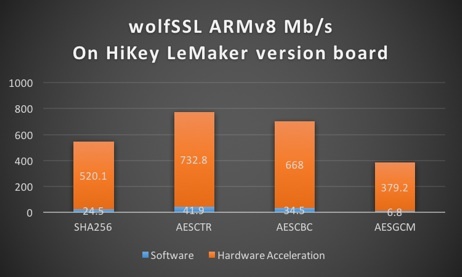 Because the underlying cryptography is a very performance-critical aspect of SSL/TLS, our benchmark application runs performance tests on wolfCrypt’s algorithms. This application is especially useful for comparing the public key speed before and after changing the math library. You can test the results using the normal math library (./configure), the fastmath library (./configure --enable-fastmath), and the fasthugemath library (./configure --enable-fasthugemath). Footprint sizes (compiled binary size) for wolfSSL range between 20-100kB depending on build options and the compiler being used. Typically on an embedded system with an embedded and optimized compiler, build sizes will be around 60kB. This will include a full-featured TLS 1.2 client and server. For details on build options and ways to further customize wolfSSL, please see Chapter 2 of the CyaSSL Manual, or the wolfSSL Tuning Guide. 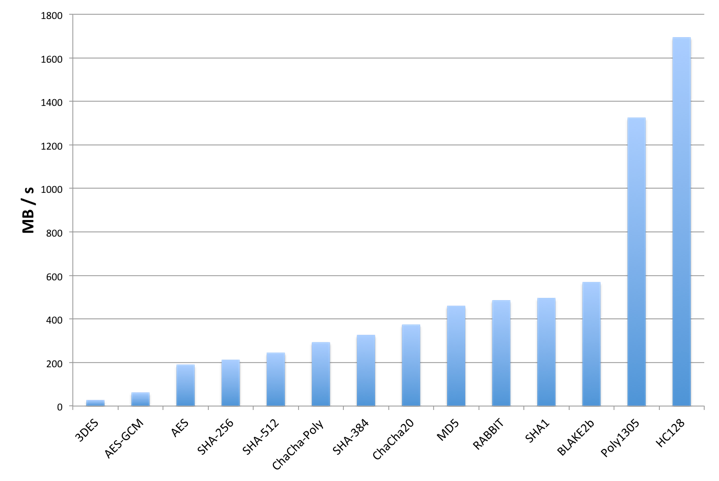 Regarding runtime memory usage, wolfSSL will generally consume between 1-36 kB per SSL/TLS session. The RAM usage per connection will vary depending the size of the input/output buffers being used, public key algorithm, and key size. The I/O buffers in wolfSSL default to 128 bytes and are controlled by the RECORD_SIZE define in ./wolfssl/internal.h. The maximum size is 16 kB per buffer (as specified by the SSL/TLS RFC). As an example, with standard 16kB buffers, the total runtime memory usage of wolfSSL with a single connection would be 3kB (the library) + 16kB (input buffer) + 16kB (output buffer) = around 35kB. The TLS context (WOLFSSL_CTX) is shared between all TLS connections of either a client or server. The runtime memory usage can vary depending on how many certificates are being loaded and what size the certificate files are. It will also vary depending on the session cache and whether or not storing session certificates is turned on (--enable-session-certs). If you are concerned with reducing the session cache size, you can define SMALL_SESSION_CACHE (reduce the default session cache from 33 session to 6 sessions) and save almost 2.5 kB. You can disable the session cache by defining NO_SESSION_CACHE, reducing memory by nearly 3 kB. As we port wolfSSL to various platforms, we oftentimes conduct benchmarks on these platforms. Below you will find a collection of some of those benchmarks for reference. If you have benchmarked wolfSSL on a specific platform, please send us your benchmark numbers (with specific platform and library configuration) and we’ll add them to the list! 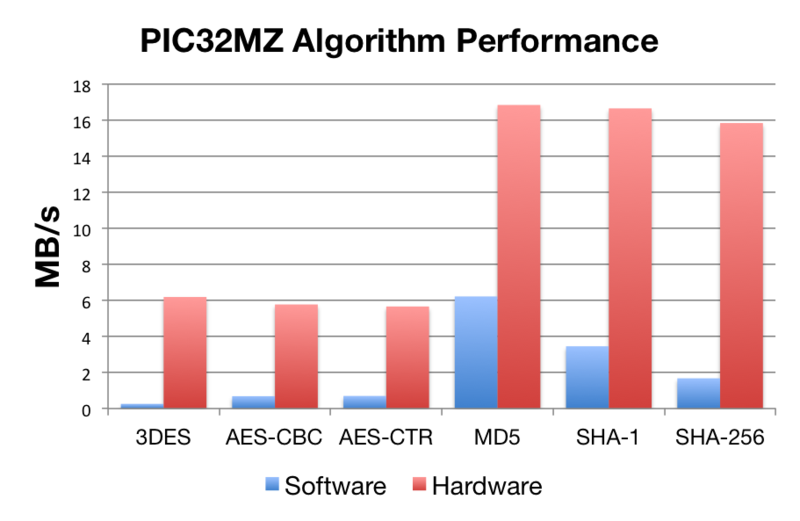 Benchmarks were collected using PIC32MZ Ethernet Starter Kit, using the wolfCrypt benchmark application and compiled with MPLAB X.
Benchmarks were collected using STMicro Evaluation Boards, using the wolfCrypt benchmark application and compiled with IAR EWARM (Optimization: High/Size). Benchmarks on Apple’s new A11 processor in their latest iPhone 8 / 8 Plus and iPhone X. This processor features six ARMv8 CPU cores (2 high-performance 2.53GHz and 4 high-efficiency 1.42GHz). 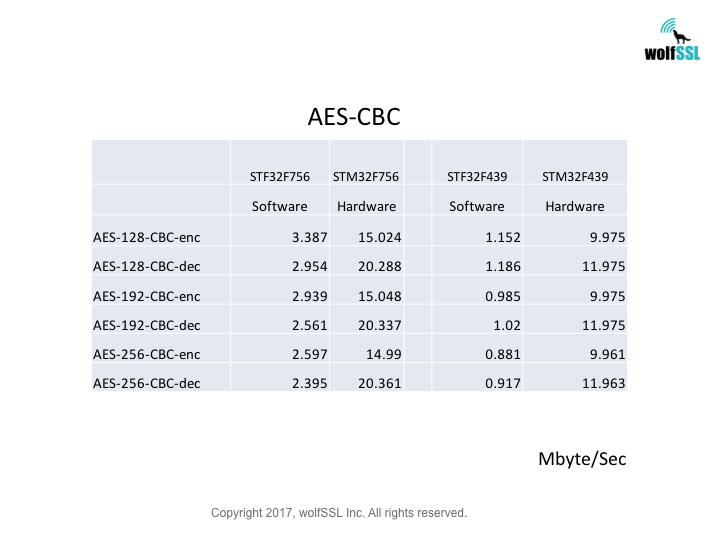 The benchmarks use wolfSSL’s latest speedups for ARMv8 crypto extensions and single precision math to demonstrate our exceptional performance. Benchmarks of wolfCrypt running in an Intel SGX enclave. 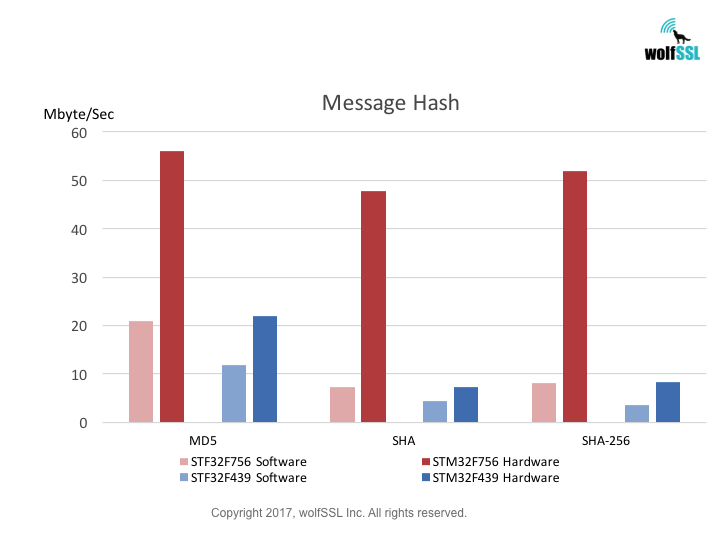 These benchmarks show that running wolfCrypt cryptography inside SGX has minimal performance impact on cryptography operation. The TLS connection establishment time is 5.73 times faster with the ATECC508A. * This included our test driver code, about 3kB. 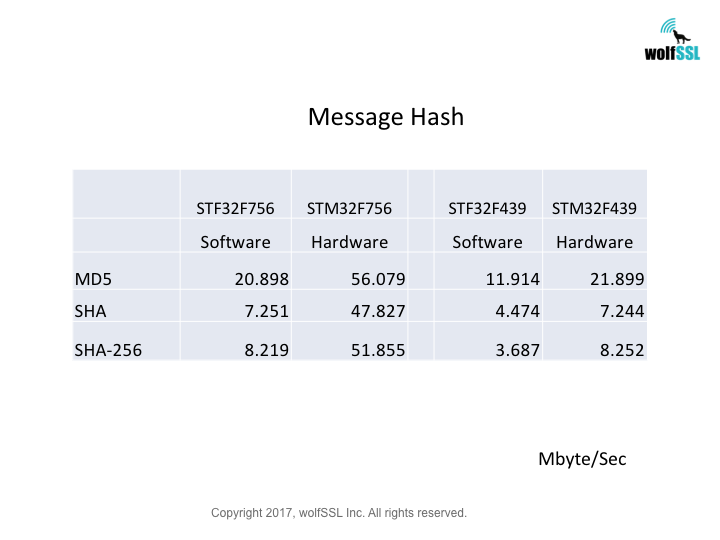 Although the performance of individual ciphers and algorithms will depend on the host platform, the following graph shows relative performance between some of wolfCrypt’s algorithms. 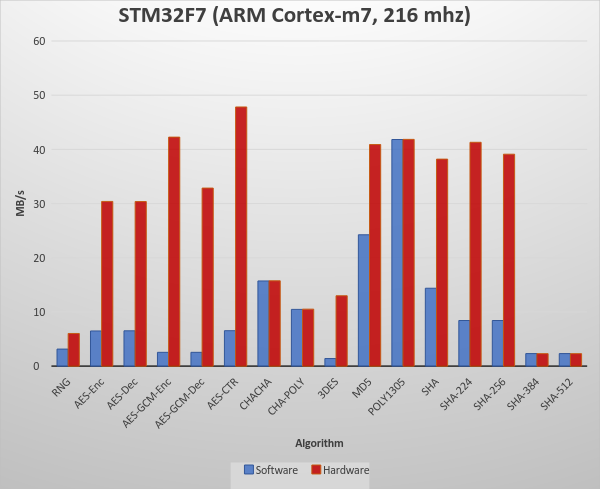 These tests were conducted on a Macbook Pro (OS X 10.6.8) running a 2.2 GHz Intel Core i7. The processors native register size (32 vs 64-bit) can make a big difference when doing 1000+ bit public key operations. With the default wolfSSL build, we have tried to find a good balance between memory usage and performance. If you are more concerned about one of the two, please see Chapter 2 of the wolfSSL manual for additional wolfSSL configuration options. Bulk Transfers: wolfSSL by default uses 128 byte I/O buffers since about 80% of SSL traffic falls within this size and to limit dynamic memory use. It can be configured to use 16K buffers (the maximum SSL size) if bulk transfers are required. 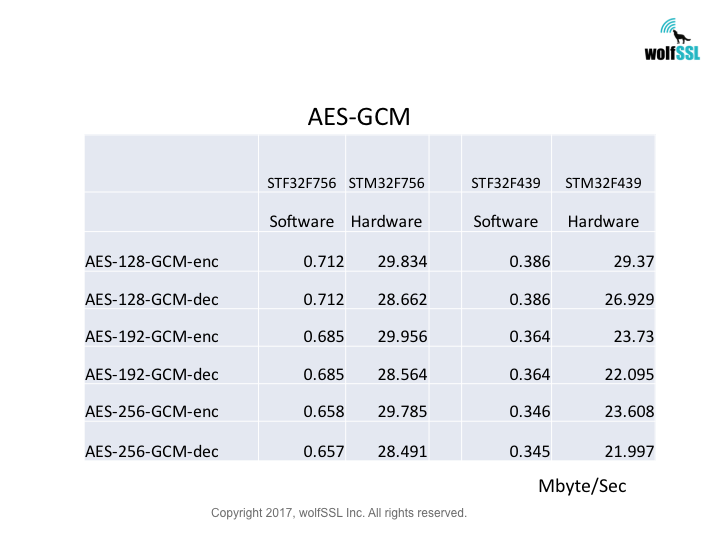 This flyer details the performance gains that can be seen when using the wolfSSL embedded SSL library with Security Innovation’s NTRU cipher. NTRU is similar to the RSA public key algorithm but can offer anywhere from a 20-200X speed improvement. Because wolfSSL can offer fast encryption and low memory usage it can easily be leveraged onto high-volume servers supporting many thousands of connections. This flyer demonstrates memcached benchmarks using wolfSSL.